Sometimes knitting creates drama. Most of the time it’s a lovely and relaxing thing to do, but sometimes it’s drama. I finished my lizard ridge strips, and it was time to seam them together. Now, it took me a total of 4 years to finish each of these strips, so I’ve had ample time to think over the seaming. And, the idea of that much mattress stitch didn’t please me at all. I also felt that perhaps the blanket would do better having a seriously stable seam. So, my idea was to pick up stitches on the side of each strip, and then 3 needle bind off those stitches to keep a stable seam. I knew that this could mean that I’d have some of my grey yarn showing in between the strips, but since I’ll also use the same grey for the border, that didn’t seem problematic. So, I started on the first two strips. I identified that I needed to pick up 52 stitches per block, and I picked up stitches using a stitch marker in between the blocks just to make sure I stayed on track. I picked up all 624 stitches, then did a 3 needle bind off of 312 stitches. I took a moment after it was done, held it up, and realized I’d oriented one of the strips incorrectly. This meant that the stripes didn’t line up. Wide stripes were paired with narrow stripes. I had this moment where I thought “Can I live with this and just do the rest correctly?” But the answer was absolutely not. So, I ripped the entire thing out and put it down for a day or so. Then, I got back to it, being more careful than before. I now have 3 connected strips, and they look amazing! Here’s the deal. I took up the lizard ridge blanket with intent to finish for a very specific reason. I knew that we’d be moving fairly soon, and it seemed that moving a finished blanket would be a good deal easier than moving a bunch of unblocked partially finished strips and all the extra yarn still needing to be knit into additional strips. I thought I’d have plenty of time for this endeavor, and while I was completing knitting quickly, and spinning yarn for the border, I wasn’t feeling rushed. I’d anticipated moving sometime in June perhaps? Maybe over the summer? I really wasn’t entirely sure, but it was still sometime in the future and I had plenty of time. So, we worked on our house projects, Mr. Ink and I, separately and together, and I knit on Lizard Ridge in my spare time. And then, we made the decision to start looking at houses, since we knew we’d be on the market for one soon. We looked, and we saw some houses that would work for our lifestyle, but weren’t in an area we adored. And we saw a whole BUNCH of houses that were disasters. And we saw houses that we adored, but got snatched right out from under us because the market is really tough on buyers right now. And then…..we found a home that fit our needs perfectly in an area we didn’t expect to be living in, but we also weren’t opposed to. This moving thing? Is going to happen far sooner than we anticipated, because I purchased that house, because I just couldn’t live with someone else owning it. But now? Not only is Lizard Ridge not complete, I have so little time to work on it because my time needs to be spent packing instead! My new goal is simply to get all the strips attached together. If I get some border work done, that’s great, but getting those strips connected will still be the best way to move the blanket. I REALLY wanted it finished to put on our bed in our new home, but I just don’t think that’s going to happen at this time. That blanket will be gorgeous! House-moving dramas are (usually) far more stressful than knitting dramas, but I hope both projects fall into place perfectly. Your lizard ridge is looking stunning already. It’s a wonderful pattern that just begs for lots and lots and lots of colour. I hope you find the perfect place for it in your new home. 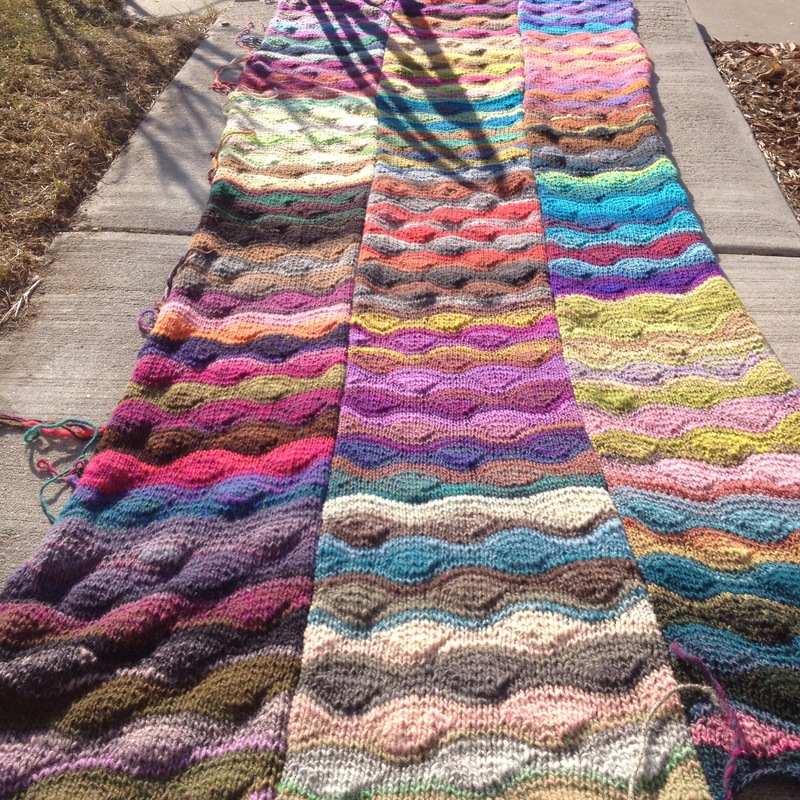 That is one gorgeous blanket! I hope it serves as inspiration. I was inspired by Dyeabolical Yarns recent Lizard Ridge finish!